Gastric duplication cysts are a rare form of gastrointestinal duplication cysts, the incidence is unknown, with only case reports published. Rectal bleeding is a rare presentation of this condition. 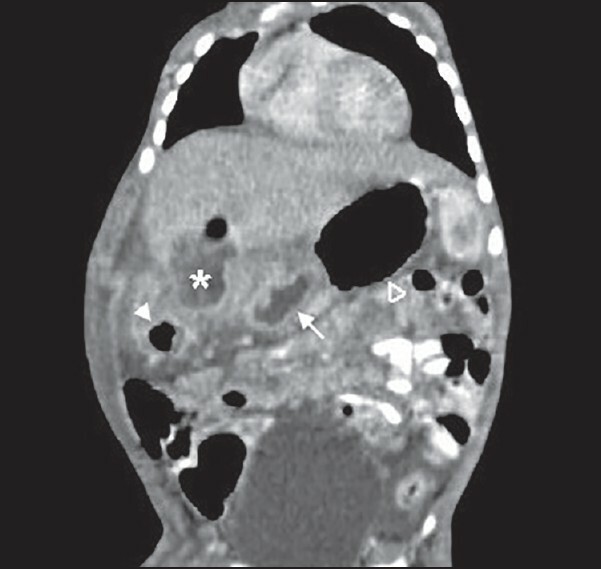 This case presentation describes the radiological findings in a child presenting with rectal bleeding due to a complicated gastric duplication cyst. A 13-month-old child presented with a history of a significant rectal bleed, pyrexia and dehydration with a background history of 6 months of intermittent rectal bleeding. The child was also found to be anaemic, suffer from chronic gastroenteritis, and chronic malnutrition. 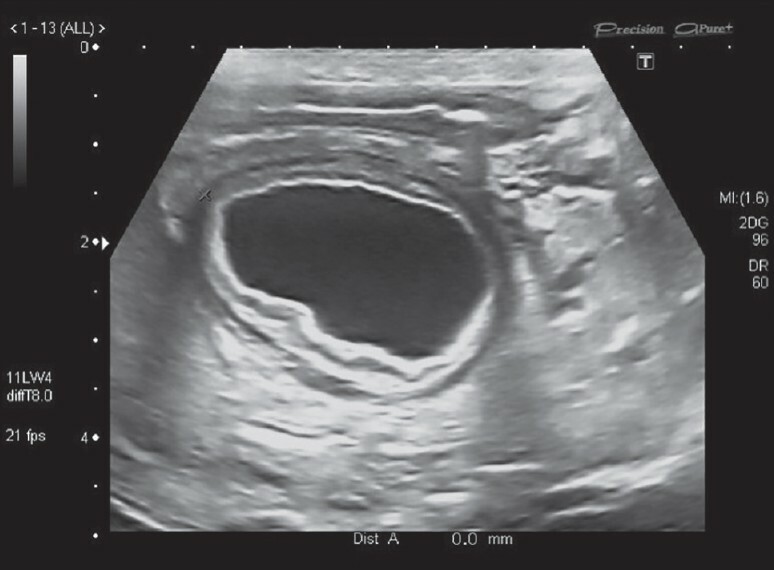 An ultrasound was performed, which excluded intussusception, however a cystic structure with the typical bowel wall signature was seen in the left upper quadrant, gallbladder wall thickening and some perihepatic free fluid were also seen [Figure 1]. A computed tomography (CT) scan was performed, which showed a cystic structure in close proximity to the greater curvature of the stomach, transverse colon and gallbladder. This structure communicated with a collection containing fluid and gas and a further fluid collection was seen anterior to the liver. Bowel wall thickening was seen in the region of the transverse colon [Figure 2]. These features were suggestive of a complicated duplication cyst. The intra-operative findings confirmed a perforated gastric duplication cyst that had eroded into the right lobe of the liver as well as the hepatic flexure of the colon. Histology showed that the duplication cyst was lined by pancreatic mucosa. Features of peritonitis were seen in the duplication cyst and colon tissue specimens. The child recovered well from the surgery; however, a prolonged hospital stay was necessary to treat the chronic malnutrition. Clinical presentation of a gastric duplication cyst depends on the size and the position of the cyst. It may be an incidental finding in an adult, however this rare congenital anomaly is more commonly diagnosed within the 1 st year of life when a complication develops. Presenting symptoms include bowel obstruction, abdominal pain or an abdominal mass. Gastrointestinal bleeding is a rare presenting feature and may be caused by peptic ulcer formation due to the cyst containing gastric mucosa. Abdominal pain could be due to over-distension of the cyst, peptic ulcer formation, internal pancreatitis, infection or rupture of the cyst. A rare form of a gastric duplication cyst occurs in the distal antrum or pylorus and can cause gastric outlet obstruction, mimicking hypertrophic pyloric stenosis. Malignant transformation of a duplication cyst is rare, the incidence is unknown, case reports describe adenocarcinoma as the most common type of malignant transformation. Due to the risk of complications as described above as well as malignant transformation, surgical removal is the recommended treatment of all duplication cysts. 1. Macpherson RI. Gastrointestinal tract duplications: Clinical, pathologic, etiologic, and radiologic considerations. Radiographics 1993;13:1063-80. 2. Lee NK, Kim S, Jeon TY, Kim HS, Kim DH, Seo HI, et al. Complications of congenital and developmental abnormalities of the gastrointestinal tract in adolescents and adults: Evaluation with multimodality imaging. Radiographics 2010;30:1489-507. 3. Berrocal T, Torres I, Gutiérrez J, Prieto C, del Hoyo ML, Lamas M. Congenital anomalies of the upper gastrointestinal tract. Radiographics 1999;19:855-72.